Those not involved in the steel industry tend to look at large, integrated blast furnace steel plants as dated technology light-years from the gleaming glass and concrete operations of IT or electronics. However, steelmakers are constantly striving for technological improvements. In fact, the very marginal nature of steel production in the western world means that constant innovation is a necessity for a firm’s survival. Comparisons between U.S. Steel and Nucor Corp. illustrate this point. When U.S. Steel was focused on cost reduction and rationalization at the turn of the century, Nucor was innovating and investing not just in alternative electric arc furnaces, but in direct casting and other downstream technologies. As a result, Nucor is now North America’s most successful steel company but they’re not alone in looking to technology for their future prosperity. 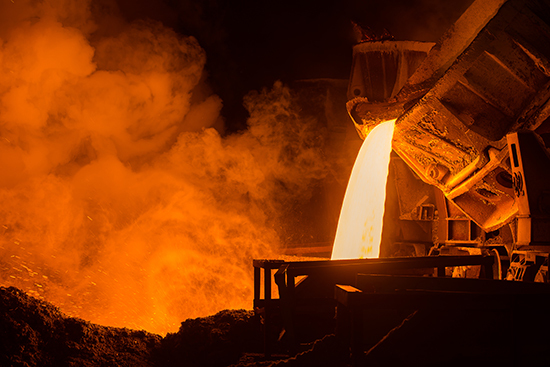 An interesting article in the Economist details efforts at a number of steel producers around the world to find a better alternative to the traditional blast furnace. The slab casting and re-rolling route is epitomized by the likes of U.S. Steel and the major Asian steel mills. For years, the only real challenger to this process was the electric arc furnace which enjoys the benefits of scrap as a raw material and greater flexibility and economies of scale allowing it to operate profitably on a fraction of the cost required throughout for a traditional blast furnace-based integrated steel plant. Innovation in steelmaking is coming from novel uses of liquid metal. Source: Adobe Stock/Photollug. One of the major attractions most EAF plants have is that they produce final product by the continuous casting route. The liquid metal is taken from the refining vessel and, for flat-rolled products, continuously cast into 80-120-mm thick slabs, which can then be further rolled to thinner gauges. But both steelmakers and university research centers are working on techniques that would allow continuous casting direct to sheet gauges while maintaining quality standards sufficient even for automotive applications. One such project at the University of Warwick in Britain is developing new high-tech steels specially for casting onto belts that then require relatively limited rolling to final gauge. Not surprisingly, Nucor has their own version of continuous casting to sheet called Castrip which employs a twin-roll process taking semi-solidified steel from the bottom of the mold and integrates it with a belt-casting process that allows the plant to economically achieve a production run 500,000 metric tons per year from a compact 50-acre site compared to the demands the integrated mill that requires 5,000 acres and a minimum of 4 million metric tons a year to even turn a profit. Plants in the U.K., Europe and China are adopting the same technology and it’s hoped the flexibility that comes from operating lower volumes while remaining economically sound will encourage steelmakers to produce closer to market and may even see a return of something like the integrated steel manufacturing and automotive assembly line pioneered by Henry Ford 100 years ago. The reduction in energy usage, and potentially reduced transport costs, will dramatically reduce the carbon footprint of steel as a result. While carbon taxes are onerous now they are likely to be even more so in the future. It won’t be long before someone thinks up the idea of ranking steel products by carbon impact, adding impetus to technologies that can significantly reduce heating, rolling and transportation in manufacture. New technologies always throw up new challenges in the process of development and steel sheet from liquid metal has proved no different. According to the Economist, Salzgitter in Germany has been operating a single-belt castor since 2012 making specialty steels. One of their biggest challenges was in keeping the sheet flat on the casting belt. Even small variations impact the quality of the finished sheet. Salzgitter achieves this by operating a vacuum under the plate, but McGill University in Montreal, Quebec, Canada — one of the pioneers of the new technology — achieved the same outcome with magnets. Either way, it’s hoped the belt casting or a combination of twin-roll and belt casting will achieve much more than just cost reduction. The research center at the University of Warwick has managed to create advanced, low-density steels that are stronger, lighter and more flexible than conventional steels. While the belt-casting process opens the door for much wider sheets than the dimensionally constrained twin-roller approach may allow. It would seem innovation and technological development are alive and well in the steelmaking industry, and will likely not just maintain cost competitiveness but give the industry options to counter the threat from products like aluminum in the construction of automobiles.